It takes a lot of "hot" to make a little "cold." That is, much heat energy input (hot power) is required to provide a little cold power. For example, if you would like a nickle's worth of liquid nitrogen (a bucket full) it may cost you about a dollar's worth of heat energy (power bill). So that bucket full cost $1.05: five cents for the nitrogen (and shipping & handling costs) plus one dollar for the power bill involved in making it. Cold costs money! Below are some basic figures on cold powers and the corresponding hot powers needed to make that cold happen. The temperatures are some popular ones in cryogenics, starting with the normal boiling point of liquid nitrogen (77 K). Those are a lot of watts for one watt. 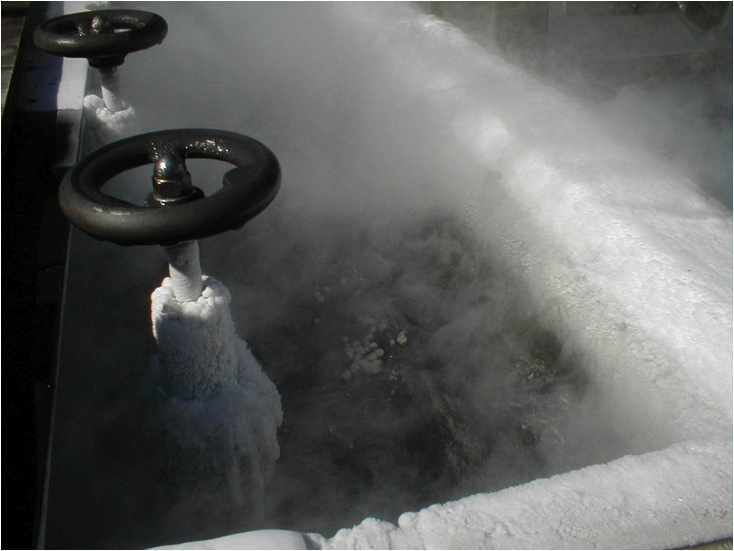 For one single watt of cooling at liquid helium temperature, about one thousand watts of power are needed. Wow. And for what? A cold watt, that's what. As another illustration of the extremes of cryogenics, consider that you have a really good oven at home (a 700 degree F commercial pizza oven, of course) and you want to put a jug of water in there are keep it for a few months. Water boils at 212 degrees F and the oven is kept a just above 700 degrees F, a temperature difference of 500 degrees F. Crazy, impossible? Not at all. This same situation is rountinely handled by a vacuum-jacketed, multilayer insulated liquid hydrogen storage tank. The hydrogen boils at -423 degrees F and the oven is kept at about 80 degrees F (hotter in Florida at the Kennedy Space Center's launch pads); again, the same temperature difference as our jug of water in the pizza oven. The large temperature differences, no matter what the cryogen, is the reason that thermal insulation is the single enabling factor for everything on Earth (the "oven") in the world of cryogenics. 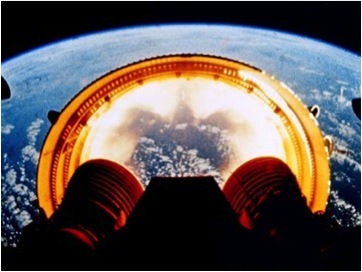 Saturn V - Upper Stage separation and a lot of hot and cold going on.